Pennsylvania is that state that seems to go on forever. 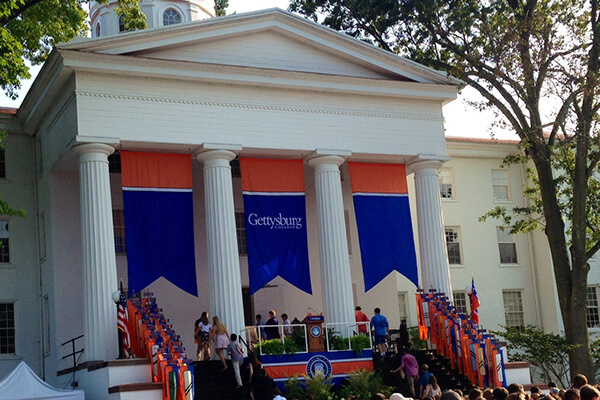 But somewhere about halfway through lies a little gem called Gettysburg College. Do you remember learning about the Civil War in high school? Yeah, it happened on and near our campus roughly 153 years ago. We may be a school surrounded by miles of battlefield, but we do have one beautiful campus. We’re pretty proud to call this place home. 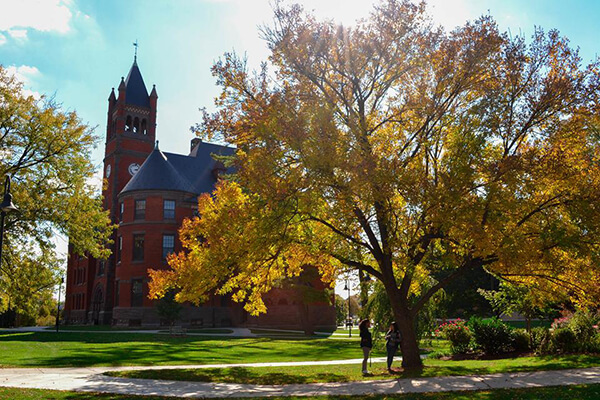 Check out the 10 most photogenic places around Gettysburg College’s 230-acre campus. Gettysburg is notorious for having a lot of rain in the fall and spring, but even during those rainstorms, the weather doesn’t disappoint. One of the first tips you’re told as a first-year? Make sure to pack your rain boots and jackets. Gettysburg typically gets enough rain to make you sprint from building to building, but some days the sky is just too pretty to pass up a photo op. “Even on rainy days, Gettysburg always has something beautiful to offer,” said junior Kate Helmstetter. If you can see past the beer-soaked floors and left-over mixer decorations, our fraternities have pretty decent houses. 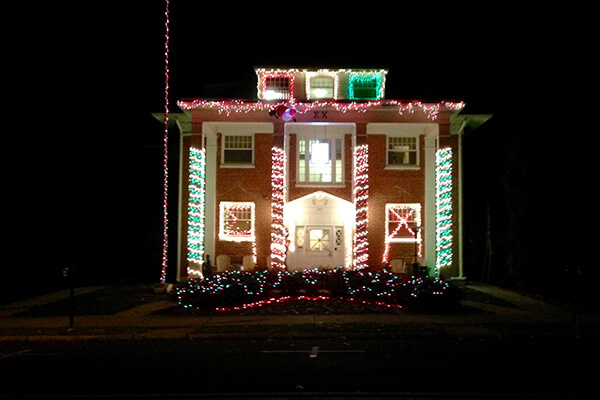 The brothers of Sigma Chi stand out particularly, especially with their killer Christmas decorations. You’ll often find the brothers hanging out on their porch with smiles on their faces. “Greek life has really given me an opportunity to come out of my shell and make meaningful, life-long connections on campus. You’re constantly surrounded by people who will hold you accountable and push you to be the best you can be. I’m thankful to be able to call such an extraordinary group of men my brothers,” said junior Michael Boncardo. As much as we love our library, the free coffee after midnight and the friendly faces of the staff, sometimes the typical routine of studying in one building can get exhausting. When the sun comes out to play, you’ll find students on blankets out on “Muss Beach” (which isn’t actually a beacch) or other various spaces on campus. We like our sunshine and try to stay clear of the library as long as we can. “Nothing like relaxing in ‘Muss Beach’ to finish some homework in the sunshine or play frisbee with friends! 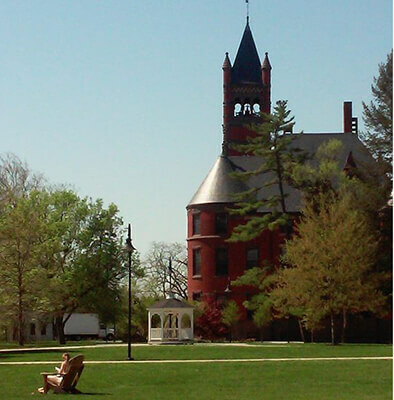 The green grass and beautiful tress make everyone want to get outside and enjoy our campus!” said junior Kate Hegwood. Everyone loves that feeling of walking outside after a long class. “Gettysburg College is picturesque because from sunsets to rainbows, nature highlights the architecturally unique campus buildings in a beautiful way. 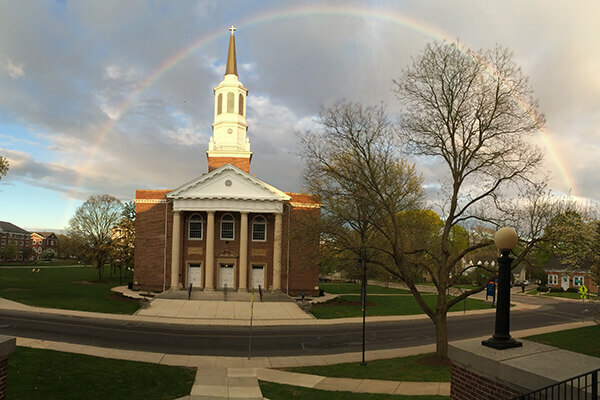 I was late for a meeting because I wanted to get a photo of the rainbow,” said senior Mary Westermann. The steps of Breidenbaugh Hall couldn’t be a better location for a picturesque view after a storm. Gettysburg’s fall season stands out from the rest as the many trees around campus light up with rich colors. You come to appreciate them more over the past few years as those prime aesthetic days only last for so long. “Autumn is one of the most difficult seasons to photograph on campus because you never know how long the leaves will stay on the trees, but it is definitely the most rewarding. The leaves always make our campus look like a rainbow,” said junior Mary Beth Bielicki. Before you know it, the leaves fall and the trees stand bare for the next few months. When it’s all said and done, the students enrich the campus. As picturesque as the campus may be, it’s even more so when students walk from class to class and engage with one another. “Gettysburg has beautiful buildings and wide open green spaces, but I think what makes Gettysburg truly beautiful are the people within those spaces who study, interact and live,” said junior Carolyn Kirsch. Like many college and universities across the country, Gettysburg begins to feel like home very quickly. From the beginning of your Gettysburg journey at Get Acquainted Day, all the way through orientation, students feel instantly comfortable amongst the beautiful brick buildings and rolling green fields. “The moment I stepped on campus I felt like I was home. Everyone was so happy and went out of their way to say hi. I felt a sense of community and knew that this school would be right for me,” said first year Morgan Small.